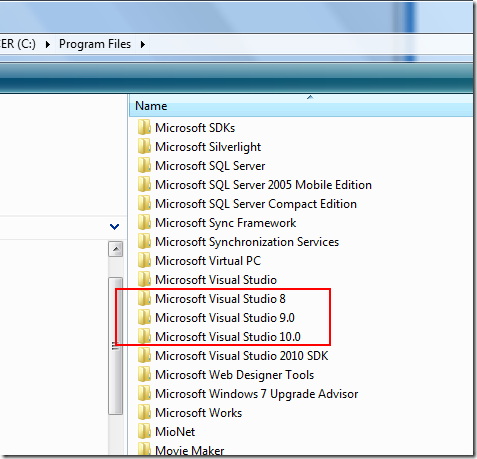 Where the heck is Visual Studio Command Prompt? You got answer on MSDN forums telling you to run devenv /ResetSettings in Visual Studio 2008 command prompt but after searching you computer you can’t find it. Where the heck is it? Look at below picture, you will be able to find it easily. 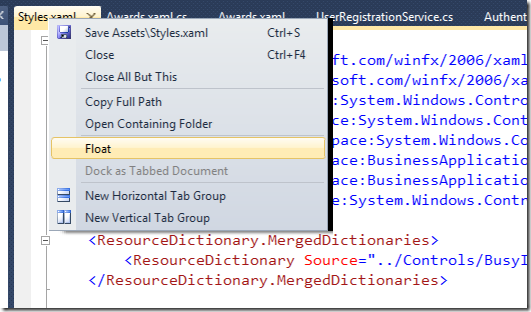 If you’re one of the fans of Multiple Document window layout in previous versions of Visual Studio, you will miss that feature in Visual Studio 2010. 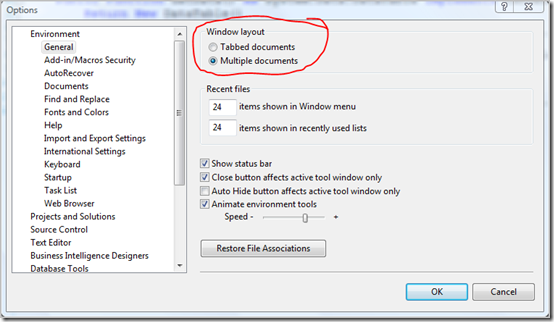 Yep the setting of Multiple document is no longer there. That would not be a big issue. 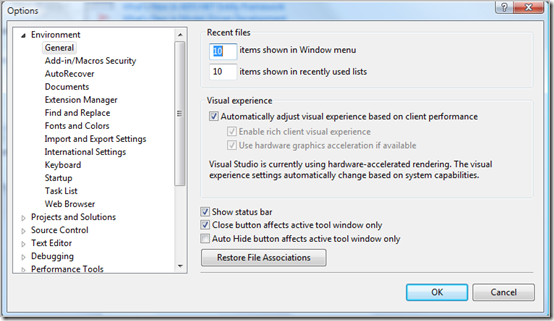 Visual Studio 2010 has new feature Floating Window. You can make the editor window to float by simply right clicking the tab title and choose Float. The editor window is now floating. You can drag anywhere. In some forums in found that people asking whether he/she can install Visual Studio 2010 side-by-side with earlier version(s) of it. I have Visual Studio 2005, Visual Studio 2008, and Visual Studio 2010 installed in one machine (OS is Vista Ultimate 32bit). If I open Program Files, I can see that they are installed in different folders. So you don’t need to worry to install Visual Studio 2010 in the same machine having previous version installed. Even though you can install in random of back-ward order, I suggest to install in forward order, VS2005 -> VS2008 -> VS2010. Having more than one version of visual studio installed is useful if you’re working with a lot of projects built using different version of Visual Studio. Because although VS2010 provides multi-targeting feature for the framework, the Project and Solution is not compatible and sometime upgrading is not a good solution if your client still using VS2005 or VS2008. Hope this information useful for you. Today when I was developing Silverlight app using Telerik RadControls, there was an error “Invalid FORMATETC structure” prevented me to complete the drag n drop of RadControls to the XAML editor. 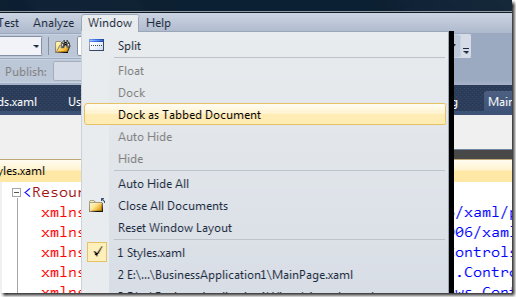 I didn’t have any idea what was caused it because I could still drag n drop the Button control to the XAML. I thought it was Telerik but it could be anything. Then the fast way to get the answer was of course Google. Oops there are may results when I searched invalid FORMATETC, that’s a good sign to get the answer. Yeah it’s not Telerik specific error but Visual Studio error. It’s caused by the reference of toolbox items were messed up. The solution was simply resetting the toolbox items by right clicking the toolbox then choosing Reset Toolbox. Be patience, it could take sometime to reload all toolbox items.